That picture was taken yesterday - at 35 Weeks and 2 Days pregnant! I may be smiling but this mama is tired! At the most! My scheduled c-section date is still December 19th which is only 25 days away! Crazy! However, my blood pressure has been creeping up at every single appointment. At first I was told it was pregnancy induced hypertension, but now my doctors have been saying preeclampsia. This has really thrown me for a loop because I never had any issues during my pregnancies with Lacie and Blakely! But Paisley was determined to be different right from the very beginning when she gave me morning sickness and a 15 pound weight gain before we even told people that I was expecting! But with all that is going on, I trust my doctors. I have been seen for weekly appointments since about 28 weeks and they are monitoring everything closely. Lots of non stress tests and bloodwork for this Mama! I may be having this little girl earlier than expected - as soon as December 5th (which is less than two weeks away). The main goal is to make it to 37 weeks when the baby is considered full term! For now, I have been put on a "modified bedrest" which is easier said than done! Stay-At-Home Mamas can't exactly apply for medical disability. But I do make every effort to put my feet up when my girls are napping or playing nicely with each other. The house may not be as clean as I like, but that's okay. 33 Weeks! This was taken a couple of days after my 32 week growth ultrasound! Paisley Jean looked wonderful and weighed in at 4 pounds - exactly what she should be measuring at this stage. From this point on she will gain about another 4 pounds. 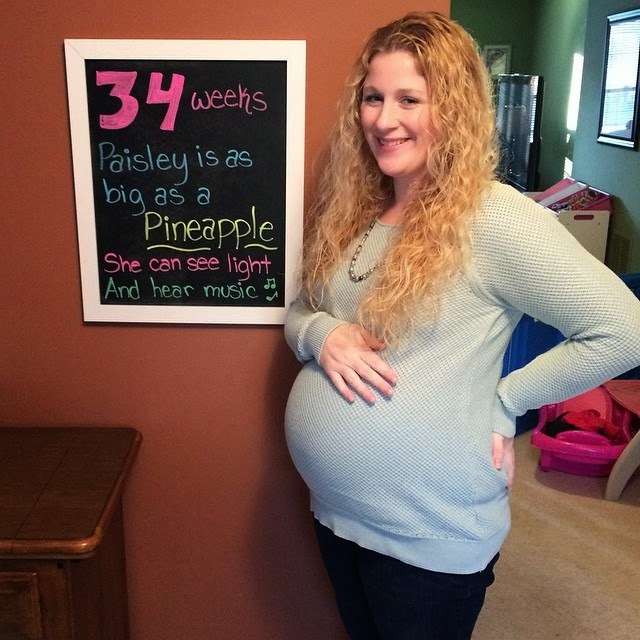 This is another way that Paisley is proving to be different - both Lacie and Blakey measured well over 5 pounds (in fact B weighed almost 6 already) at their 32 week ultrasounds. Both were predicted to be very large babies, and the doctors were almost exact about their birth weights!